Target recently had plain pink and red frames in the dollar section, so naturally I picked one up to alter it. 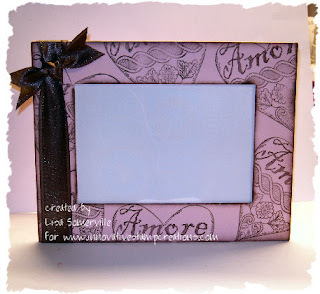 Here I used Lovely Hearts from Innovative Stamp Creations -stamping my images in Chocolate Chip. I also edged my frame using a sponge dauber and Chocolate Chip Ink. Then added the Chocolate Chip Satin Ribbon from SU. Now to find a picture to add to the frame.